Cyclists in the City: Cycling in London: Could Sadiq Khan or Zac Goldsmith be about to kill off cycling investment before it even gets started? Cycling in London: Could Sadiq Khan or Zac Goldsmith be about to kill off cycling investment before it even gets started? I haven't blogged for months and months. To some extent, I have felt overwhelmed by all the new and shiny cycling things that are going on. It is exactly four years ago that many of you took part in a ride that set out from Oval, the #tourdudanger, a ride which was intended to highlight Boris Johnson's failure to create safe cycling conditions and, above all to reject his theory that cyclists just needed to "keep their wits" about them and they'd be fine. He was talking about Elephant & Castle, a junction where there was almost one serious cycling injury every week. A serious cycling injury meaning, say, a broken back. Or worse. Clearly, the Mayor's "keep your wits about you" strategy of 2011 was a failure. And we wanted to shout that loud and clear. how I managed to snap the exact same lorry twice! Fast forward to 2015 and Oval junction is one of the first to to have been upgraded with new cycling design standards. The new design may have a couple of teething flaws (the most annoying is that motor traffic regularly blocks the cycle track as it crosses left turn lanes) but I know that TfL is aware of these issues and has ideas about improving them. The fact is that there are now people at TfL who think about this stuff. There are (relatively new) standards that they need to design to. Slowly but surely, it feels like the TfL machine has taken cycling into its head and is equipping itself to treat cycling the same way it treats the Underground - like a real and proper part of London's transport mix. And yet, I can't help noticing that, just as TfL starts to treat cycling like a grown-up transport mode, things are stirring that might bring all this good work to a bit of a messy end. Two weeks ago, I read a comment piece in the Evening Standard by Andrew Gilligan, the cycling commissioner, which brought some of this home. Gilligan honed in on some comments made by Zac Goldsmith and Sadiq Khan on LBC Radio about the cycle super highways. I've had the dubious honour of paying LBC some hard-earned cash to go back and listen to those radio slots. On the one hand, we have Zac Goldsmith implying that he thinks cycle funding should be put into 'Quietways' and not Cycle Super Highways. I can't tell exactly what Goldsmith means here but if you'll permit me, what this seems to suggest is that the Conservative Mayoral candidate thinks cycling should be down quiet back streets, out of the way (and out of sight of voters perhaps?) with decisions taken street-by-street about whether or not to accommodate cycling. That's the planning equivalent of trench warfare: cycling ok for 100 metres, rendered dreadful for the next 100 metres and then blocked by an intransigent council or bunch of residents for the next 100. It's the sort of mess that built the vastly compromised London Cycle Network - a very patchy network of routes that can be excellent in small parts of London but are downright dreadful in most of the city because those local councils or residents didn't really want to build safe cycling streets in the first place and just pocketed the cash in exchange for a few roadsigns. Sadiq Khan is a bit more ambiguous. He seems to suggest he likes the Cycle Super Highways but not the way TfL has gone about building them. He's also questioning "the route" - as if there was only one Super Highway. I'm not sure how else TfL was supposed to go about building the Cycle Super Highway but if you read Khan's comments carefully you might notice something. These comments sound incredibly similar to those uttered last year by both the Licensed Taxi Drivers Association and by Canary Wharf Group. Both organisations talked about 'supporting' segregated Cycle Super Highways. 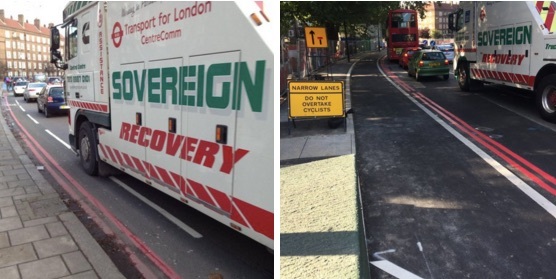 Both organisations, however, talked about 'the route' being wrong, by which they meant the Cycle Highway along the Embankment (and seemed oblivious to the fact there are already two segregated Cycle Highways elsewhere) and both openly criticised TfL's on 'process' issues relating to building the Cycle Highways. Let's not forget, the LTDA still has a court case pending (early next year I am assuming), having applied for a judicial review on the grounds that TfL should have sought planning permission before beginning construction. If you read Sadiq Khan's comments in this light, it sounds to me awfully like he, the LTDA and Canary Wharf Group are talking the same sort of language. The craziness of the LTDA case is that the Embankment Cycle Highway will basically have been built by the time the taxi drivers (may) see their day in court. What do they hope to achieve? Another year of roadworks while the thing gets dug up and more people get killed? Certainly feels that way. But I'm more worried by Zac and Sadiq. They're not exactly expressing much love for cycling as a legitimate part of the transport mix right now. If I were you, I'd start asking both of these Mayoral candidates much more about where they stand on cycling as a legitimate part of London's transport mix - one that needs proper funding and proper direction. And I'd be keeping a very cynical eye on similarities between how these two Mayoral candidates talk about cycling and how the LTDA and Canary Wharf Group talk about cycling too. The similarities are a bit too obvious, in particular in Sadiq Khan's case here.